These photos are of the "Million Dollar Bridge," a one-lane historic bridge east of Cordova, Alaska at the end of the Copper River Highway (southern segment of state route 10). The bridge was added in 2000 to the National Register of Historic Places. I took the first two photos on my summer 1994 vacation, on a van tour from Cordova to the bridge and the nearby Miles and Childs glaciers. The bridge then still reflected the serious damage suffered during the 1964 Good Friday earthquake, which dropped one bridge span into the Copper River, as well as the temporary ramp drivers could use to get to a short unpaved road on the other side. Since then, bridge was repaired, though there still isn't really very much to go to after crossing the river. Most of the photos below were taken on my revisit to the bridge in June 2009. The bridge was completed in 1910, as a one-track railroad bridge for ore trains between the Kennicott copper mines and Cordova harbor. 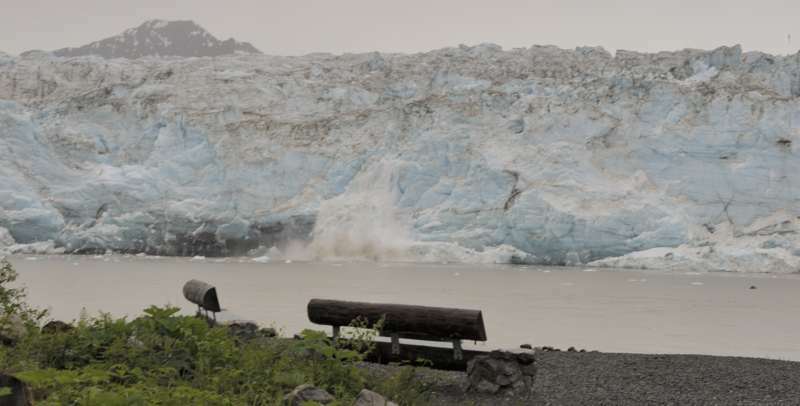 It was quite an engineering challenge, since it had to "thread the needle" between the Childs and Miles glaciers (then much closer than they are now), and icebergs floating downstream from the Miles glacier in the summer forced construction crews to do much of their work in the winter. 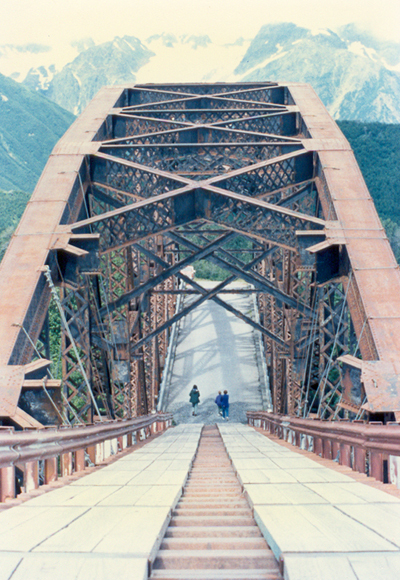 After the copper mines closed in 1938, work began on converting the old trackbed into a highway, but the Good Friday earthquake of 1964 damaged both the bridge and much of the old roadbed north to Chitina. Most of the segment north of the bridge probably will never be opened to auto travel. 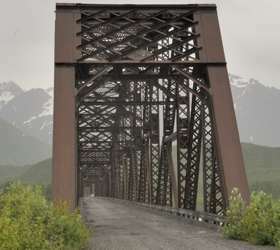 The remainder of the trackbed is now the Copper River Highway west of the Million Dollar Bridge; a short spur south of Chitina, to recreational sites along the Copper River; and the McCarthy Road from Chitina to a few miles west of the old Kennicott mines. NOTE: In case you want more detail, you can click any photo below to view an enlarged, and sometimes higher-quality (less .jpg compression), version. Those alternate versions have larger file sizes, so please be patient while they download. WARNING! 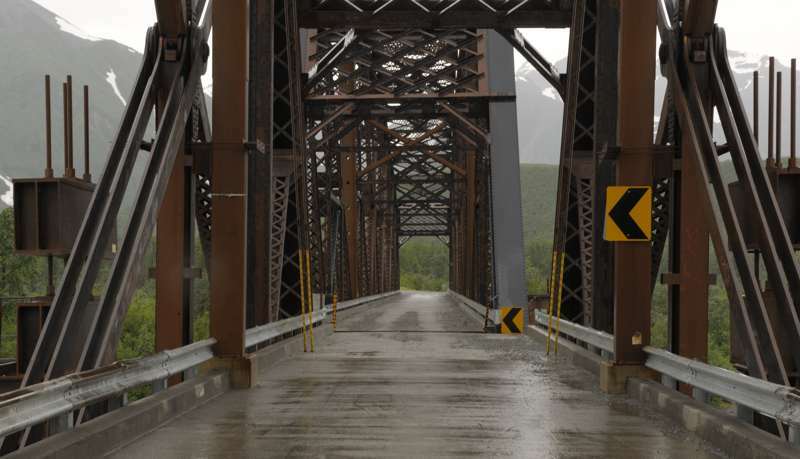 In 2011, after my second visit to the Million Dollar Bridge, there was a major partial washout of one of the Copper River Highway bridges through the river delta, and damage to at least one other bridge. 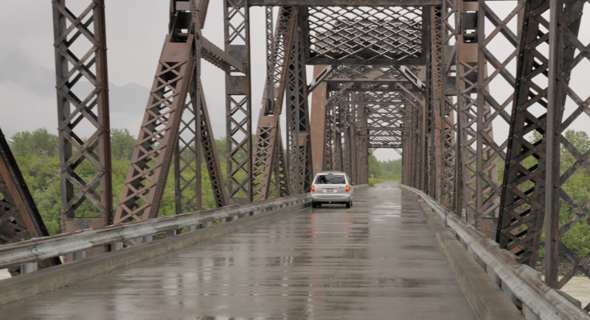 The state considered, but then indefinitely postponed for budgetary reasons, repairing or replacing the closed bridges. 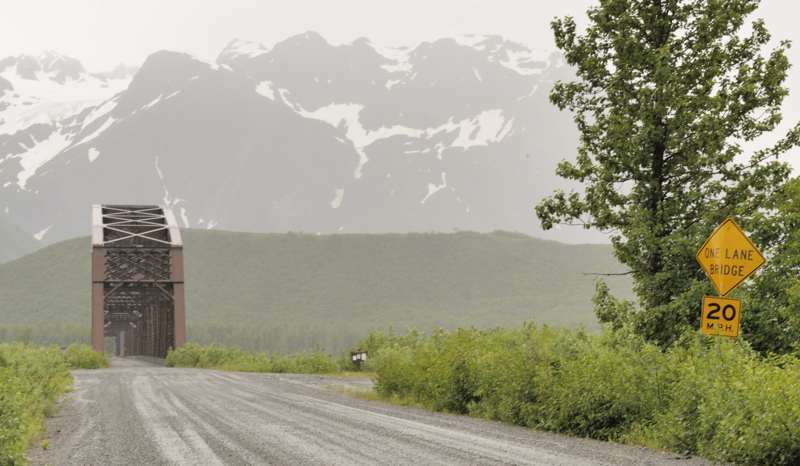 The Copper River Highway is now closed about a dozen miles short of the Million Dollar Bridge, with no firm plans to reopen it. 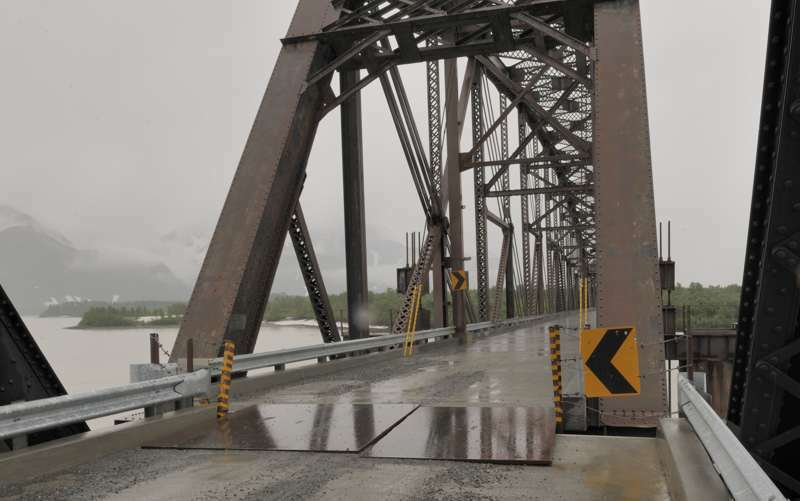 In August 2018, another part of the highway was washed out, a few miles south of the Million Dollar Bridge. 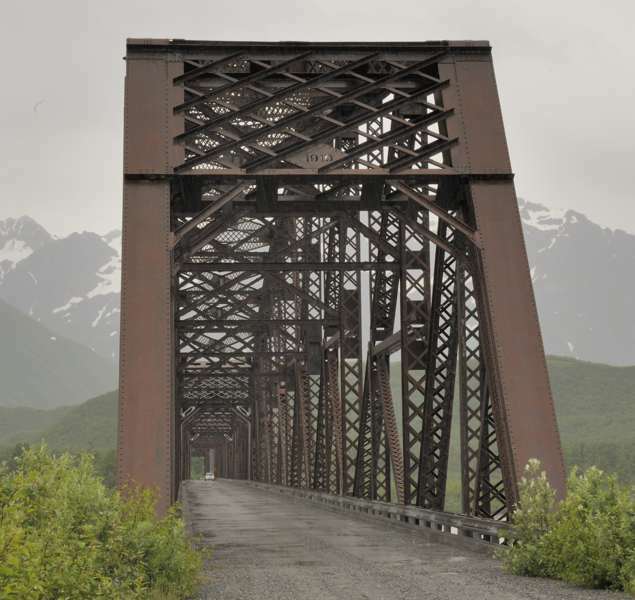 There is no alternate road route to the Million Dollar Bridge, except possibly from the north with a very rugged 4x4 following what remains of the old railroad trackbed south of Chitina (which might also be traveled on foot by a sufficiently intrepid hiker). I have no idea if that can be done, or hard it would be. Until the 2018 washout, there had been tours out of Cordova, with a vehicle shuttle from Cordova to the road closure, and a jetboat ride across the river to a shuttle parked on the other side, taking tourists the rest of the way to the bridge. The 2019 edition of the Milepost travel guide to Alaska and other Arctic highways reports these tours to the Million Dollar Bridge have been suspended. 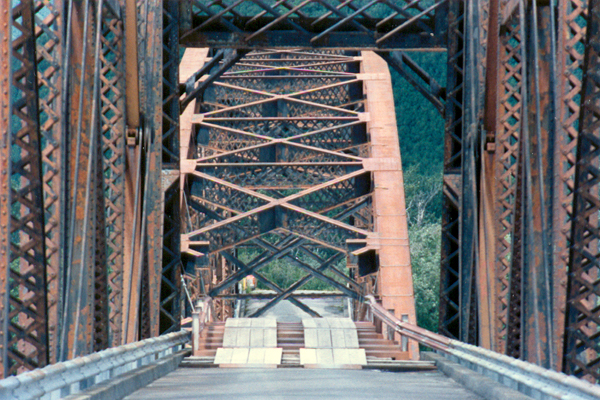 This 1994 photo, before the bridge was repaired, is from the middle of the northernmost most-or-less-intact span. 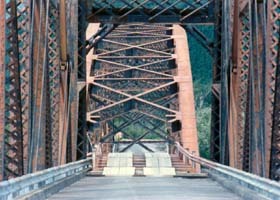 It shows the span that collapsed into the river, and the temporary transition between the two spans. Making things more interesting is that the north end of the bridge is a few feet out of line with the south end (first photo above faces northbound, the second southbound). 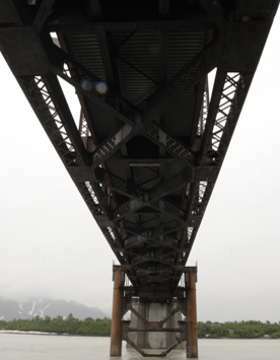 My guess is that was due to the supports added both north and south of the north pier, which protrude above the bridge deck. © Oscar Voss 1994, 2005-2007, 2009, 2018-19.